When my friend, Kathy D. and I decided to do these "My Little..." series from Kathy Schmitz, we chose the color of crackle fabric and thread we were going to use for each of ours. I chose this color fabric, and the brown thread. 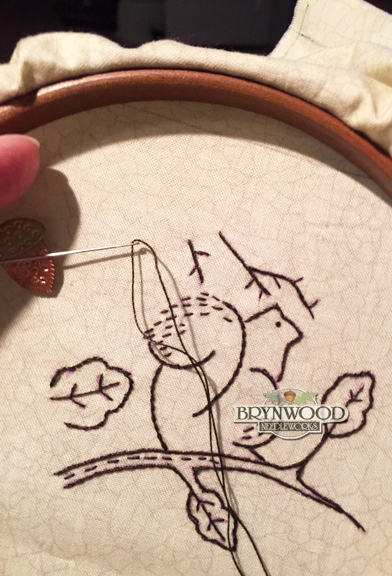 I promptly stitched out the first embroidery in brown (an acorn and oak leaf design), and set it aside. When I next went to work on the minis, I pulled the pattern, fabric and black thread. Then I stitched out these three designs from the sets. It wasn't until yesterday morning when I pulled out the basket with all my supplies, that I realized I had two spools of brown thread tucked in my basket. I looked back at my first embroidery, and that's when I realized my mistake. I really do like the brown better for this project, so while I waited in the hospital today, I stitched another one of the three I did in the wrong color. It reaffirmed my decision to go with the brown. I'll quickly redo the other two, and then I'll have them all corrected so I can proceed to new designs. I've taken the black thread out of my sewing box so I can avoid grabbing the wrong one by accident. I'll make something fun with the three that were done in black thread. Maybe they'll become a Christmas gift for someone on my list. Handsome underwent surgery yesterday. I didn't know it was imminent until I spoke with him in the morning. I quickly got to the hospital so I could be there when the surgeon arrived to explain the procedure. He came through the surgery with flying colors, but he's understandably uncomfortable. I'll be back at the hospital today - where I should be. 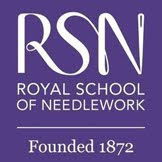 I'll take along my needlework to keep my hands busy while I tend to my dear husband. "It's what we do." Sending out good vibes to you and handsome!